Two websites, the company’s going public, lawsuits in many parts of the world: what is happening at Arduino’s? Everything will be made clear in this interview with Massimo Banzi, a few hours after the launch of the new logo and brand, “Genuino”. Those who just deal with technology, and that in the past years have used Arduino boards just to unleash their own creativity, will surely have been surprised in learning that Massimo Banzi – recognized by everyone as the undisputed leader of team Arduino – was the one to present a new brand and a new logo at the Maker Faire in San Mateo (held during the week-end from the 16th to the 17th, in the last May): Genuino. 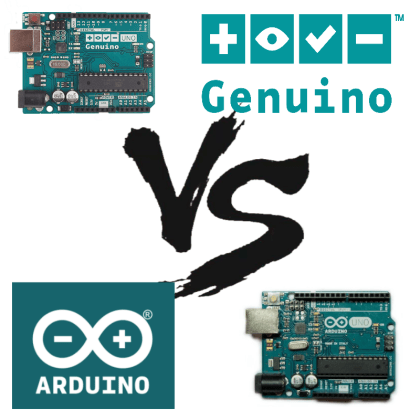 A sudden change of strategy in the thorny question concerning the usage of Arduino’s trademark, that sees Banzi (and the other team founders) as opposed to the only italian representative in the group, Gianluca Martino. Martino has stopped any kind of cooperation, once and for all, after having changed name – from Smart Projects to Arduino srl – to the society that manufactures all the Arduino-branded boards in Italy, and has entrusted the guidance of the society to CEO Federico Musto. The strategy illustrated during the presentation at the Maker Faire should overcome the impasse connected to the many ongoing lawsuits, by giving to Massimo Banzi the possibility to continue the course started in 2005; a sort of “Indipendence Day”, as Banzi himself called it. The day after, Massimo Banzi granted us an interview, in which he explained the reasons of this choice to the Italian community, a choice essentially due to the excessively long times needed by the legal process, that would have clipped the wings to the project’s evolution. A few months ago already, Banzi had broken the silence on the subject (also as a consequence of the statements from the new Arduino srl’s CEO Federico Musto), by bringing what was happening to the knowledge of Arduino’s fans, and by claiming the ownership of the trademark. 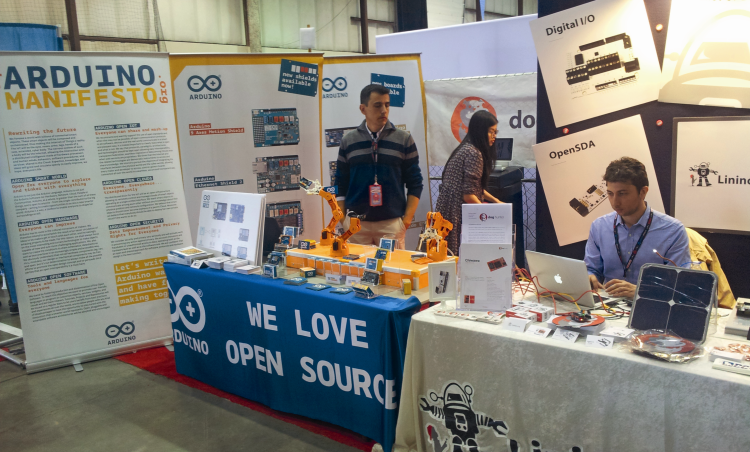 below, the stand of Arduino.org. 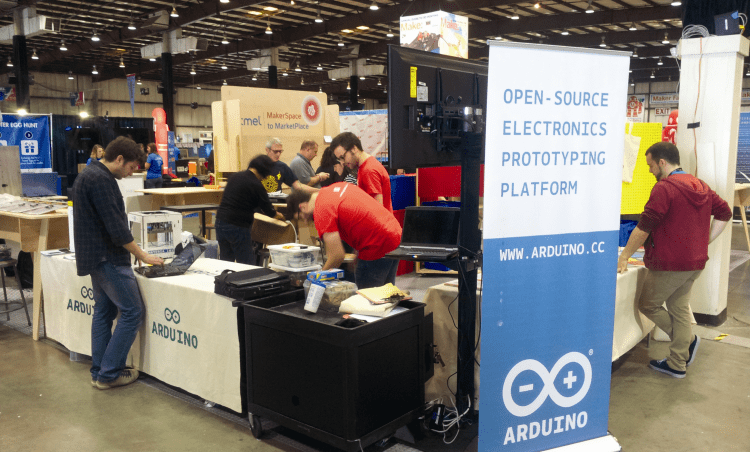 The launch of the new brand and the disclosed strategies cannot be understood without knowing the story of Arduino’s project, and the events that happened in the last months. Arduino’s project was born in 2005, at the Interaction Design Institute in Ivrea (which was established by Olivetti and Telecom Italia), out of the need to make a simple tool to work with microcontrollers available to the students that followed Interactive Design courses, and who did not possess any knowledge in the field of electronics and computer science. As Banzi himself (back then he was a teacher in that school) explained to us in a previous interview, after many attempts with the products that were then available for sale, and by taking into consideration the difficulties found by the students, a group of teachers and students decided to create its own product and a particularly simple development software. The team members Arduino into an image of a few years ago. In this way, Arduino’s project came alive (and took his name from a bar in the vicinity of the school). To ensure that even other students (being in the same conditions of the ones in Ivrea) could use this work, the team decided to make both software and hardware available to everyone, by distributing the project under the terms of the GPLv2 and Creative Commons Attribution-ShareAlike licenses. 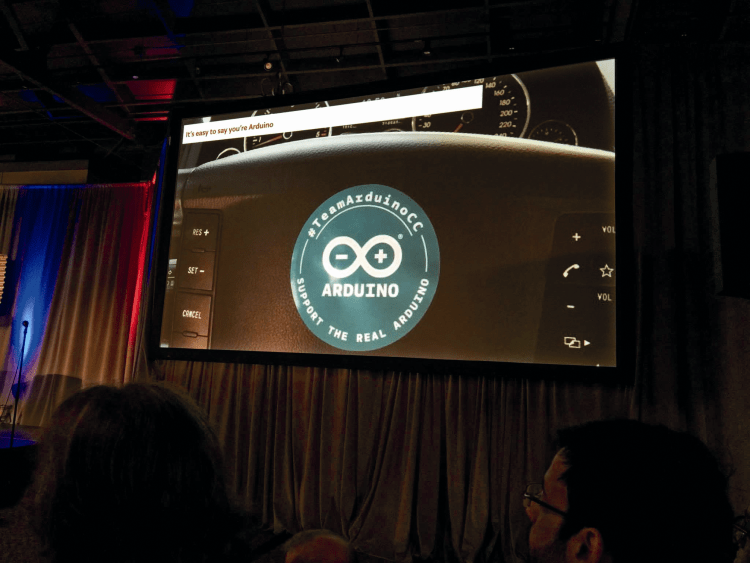 The only thing that the team wanted to protect – by keeping it for itself – was Arduino’s brand and logo. The first boards were produced by Gianluca Martino’s company. He was then the owner of a small manufacturing firm in Strambino (TO – Italy), and contributed to the project by bringing his own working experience in the manufacturing field. The other team members were David Cuartielles, Tom Igoe and David Mellis. Thanks to its unique features, the project achieved global success, thus contributing to the open hardware culture and to knowledge sharing, being favoured in this by Internet’s development. But the one to truly drive the project to success was surely Massimo Banzi, the only one in the group to “commit himself” and to pursue with perseverance the open-source hardware spirit, also sharing this vision and involving all the major semiconductors and software producers, from Intel to Microsoft, that are all but “open” companies. And giving life to a community that has developed and shared thousands and thousands of projects on the Internet. His vision, meaning outsourcing not just for the design phase but for some boards’ manufacturing as well, could not be liked by him who produced the boards in Italy, that is to say Gianluca Martino. As regards the trademark, in the United States it was registered in 2008 by Arduino LLC (partaken by the five founders), while in Italy it was registered by Gianluca Martino (without the other team members knowing it, according to Banzi’s version). After the final rift with the other members, Martino changed name to the company (from Smart Projects to Arduino srl), opened a new e-commerce website named arduino.org (which is very similar to arduino.cc, as regards the looks) and entrusted to Federico Musto the role of CEO of the new company. He also sold 95% of the shares of the new company to Musto. Everything happened while royalties were no longer recognized to the other founders of Arduino’s project (still according to Banzi’s version). Thus lawsuits started – and they are still ongoing – with Banzi & Co. trying to regain control of the trademark. 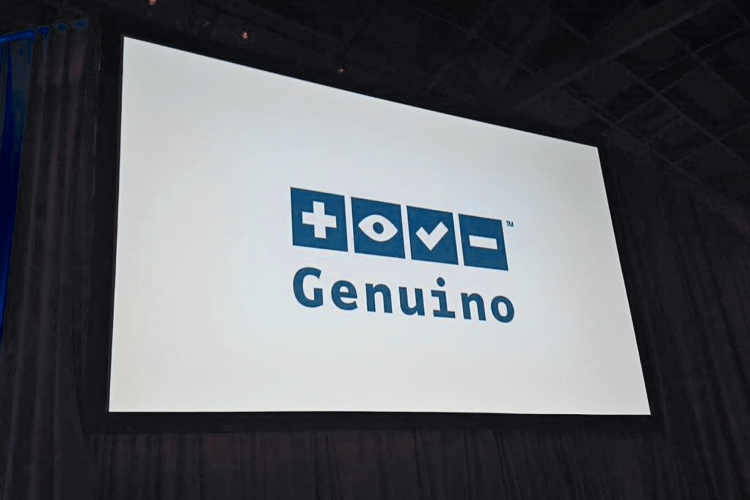 From his point of view, Federico Musto claims full availability of Arduino’s trademark. As he explained a few months ago, he wants to give to the company “an industrial and global dimension”, and to increase the sales volume from the current 15 million euros to about 50 millions in a few years, and with the possibility of being quoted at the stock exchange, so to find new occasions for growth. Currently, therefore, those who want to buy an Arduino-branded board have to go to Musto-Marino’s company, that keeps to develop the project, by relying on engineers of the Dog Hunter company (the one of Linino) and on a start-up from the University of Messina. Probably, if things will go the way indicated by Banzi, something in the next months will change, starting with the American Market. The brand with which the products will be sold outside the US. But what did Banzi say in San Mateo, exactly? 1) As regards the US market (in which the Arduino trademark belongs to the old team) and that represents about 50% of the global business, an agreement has been concluded with Adafruit, concerning the manufacturing of all Arduino boards, starting with Arduino Uno. 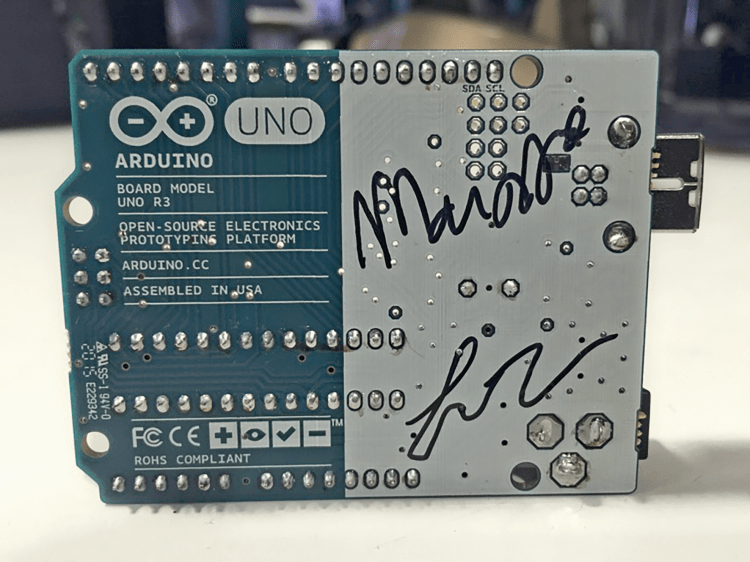 As a matter of fact, in the last days the pictures of the first manufactured boards appeared on Adafruit’s blog, and they were signed by Massimo Banzi and Lady Ada. 2) In the rest of the world, old and new products will be commercialized with the Genuino brand and will be manufactured by local firms, with which agreements are being concluded. As regards Italy, negotiations are ongoing with a pair of companies. 3) The development of new products and of the IDE will continue in the offices that are scattered all around the world, where Arduino has some branches: in Torino, in the USA, in Switzerland, in Sweden and in India. Banzi also announced the first product to be designed and manufactured by Bangalore’s branch, in India: Modulino, while the eagerly awaited Arduino Zero board (the 32 bit version) would be available in the USA since the 9th of June. Shortly a new IDE version would be also available, and it should be open to third-party products. This strategy will let Massimo Banzi to leave aside the actually ongoing lawsuits, since the usage of the Genuino trademark does not infringe any law. Banzi’s words have been followed with great attention by a packed room, and followed by clapping of approval from the listeners. “In the end, the presentation went very well, there were a lot of people… To say the truth I was a bit moved, too.” So told us Massimo Banzi, the day after. In these months I have been thinking all the time to how the community will react to these news, but then you see that the hall gets much more crowded than usual, and that people shout words of encouragement at you, you understand that the community is still with you and this is what matters. The two stands (the one of Arduino.org and the one of Arduino.cc) are a few paces from where we are, with the majority of Maker Faire’s visitors being unaware of this dispute. 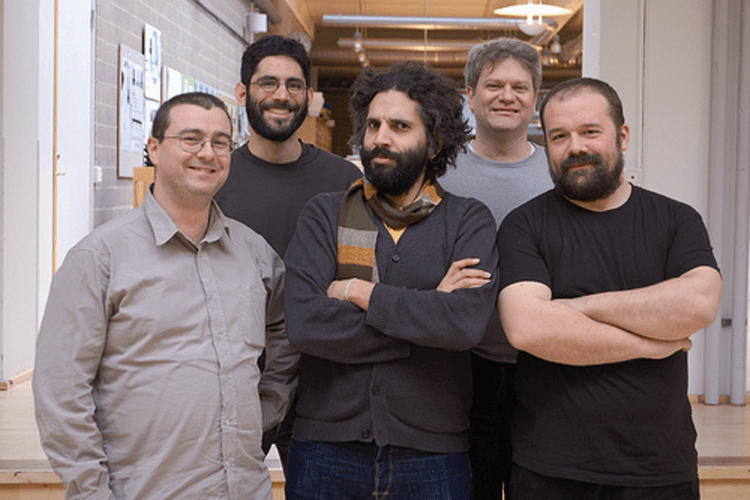 From his point of view, Federico Musto at the stand of arduino.org didn’t give for granted the solution advanced by Banzi: “Even in the USA there is an ongoing lawsuit concerning the trademark and it is not said that Banzi may act as he just announced”. Yesterday we made this announcement to explain what we will do in the next months; many in the Arduino’s community know that there are legal problems, that they have been going on since a while and that we are trying to solve them. From a certain point of view, however, it is not possible to have your life to depend from lawyers, it is necessary that things go on. This story is a very complex one, nonetheless I am convinced that in the end the facts and justice will prove us right. The times needed by justice are very slow ones, however, thus in the meantime that justice takes its course we clarified the situation as for the next future: here in the USA, where we own the trademark we concluded an agreement with Adafruit, that will deal with manufacturing and commercializing Arduino boards; this society from Manhattan offers the highest guarantees, has a story of great achievements and has been established by a woman that still today possesses 100% of the company. Lady Ada (who is a great friend), started from zero ten years ago, just like us, and has never received money from venture capital companies, or any other funding. 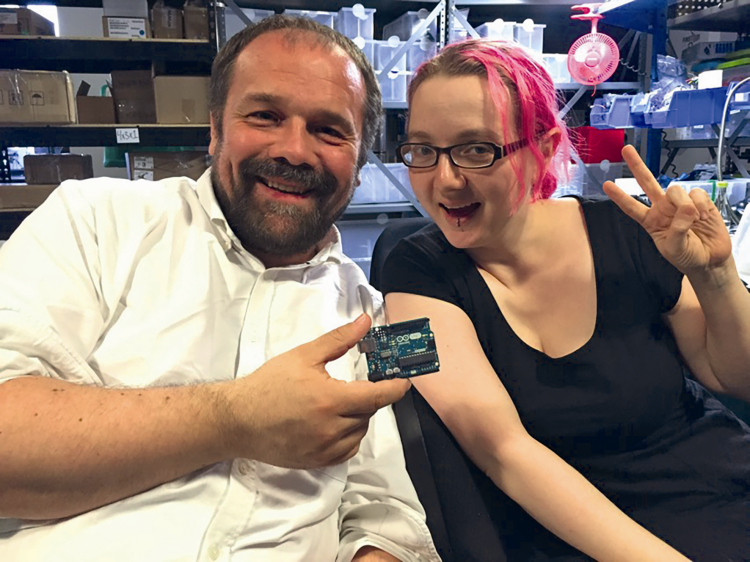 With Adafruit we established strategic partnership, a very important one for the US market. Outside of the United States the brand situation is a bit more complex, and often difficult to understand. For this reason we have thought to a new brand that could be attributed to the team who gave life to Arduino’s project. Thus we gave life to the Genuino brand, that we will use for manufacturing outside of the USA, and whose products the customers will be able to buy from our website arduino.cc; we will thus give a chance to the persons belonging to our community, whichever the country they live in, to buy our original products. We have already received lots of e-mails going in this direction and we thought that this was the solution to satisfy the needs of these persons, as soon as possible. As regards the boards manufacturing, yesterday I read some comments on some social networks, pertaining the fact that the manufacturing will be moved outside of Italy. I would like to point out that it wasn’t me to move the manufacturing out of Italy, but it was the Italian manufacturing that took another direction and that prevents me, from a legal point of view, to manufacture an Arduino branded board in Italy. In the meantime, this is the solution we thought.